How do you keep your device safe when travelling? With the use of mobile technology, such as laptops and tablets, there is a need for tough, but stylish, bags to carry it around in. You can’t just throw it in a carrier bag and hope it survives the pressures of a busy shopping mall, the subway or an airport. 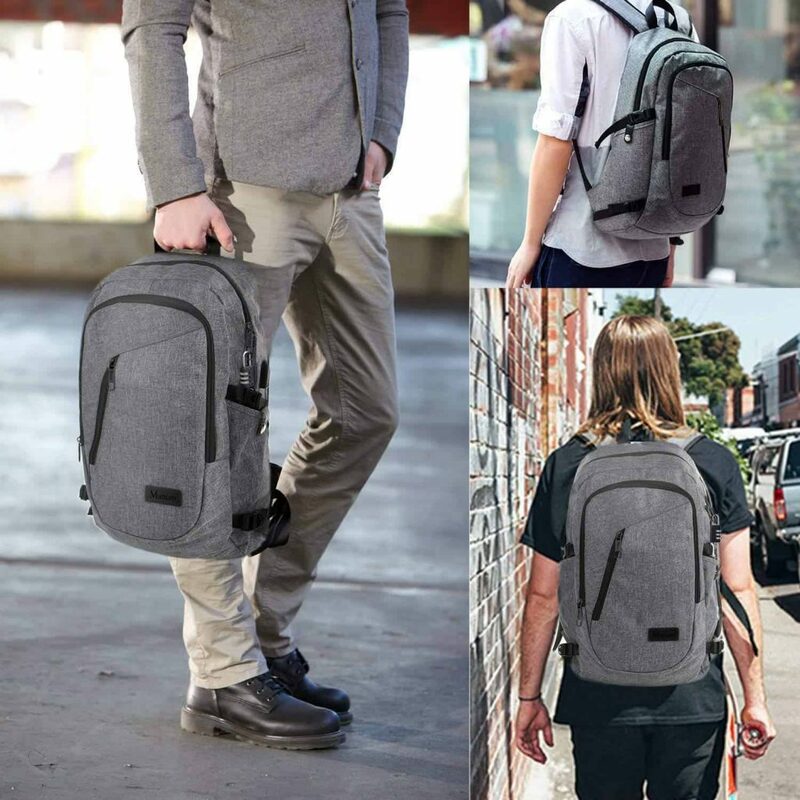 So, we’re turning our attention to laptop backpacks – the bag you can take anywhere and still look cool. Carry a takeout coffee in one hand and have the other free and unencumbered, knowing that your laptop is out of harm’s way, locked and secure, on your back. 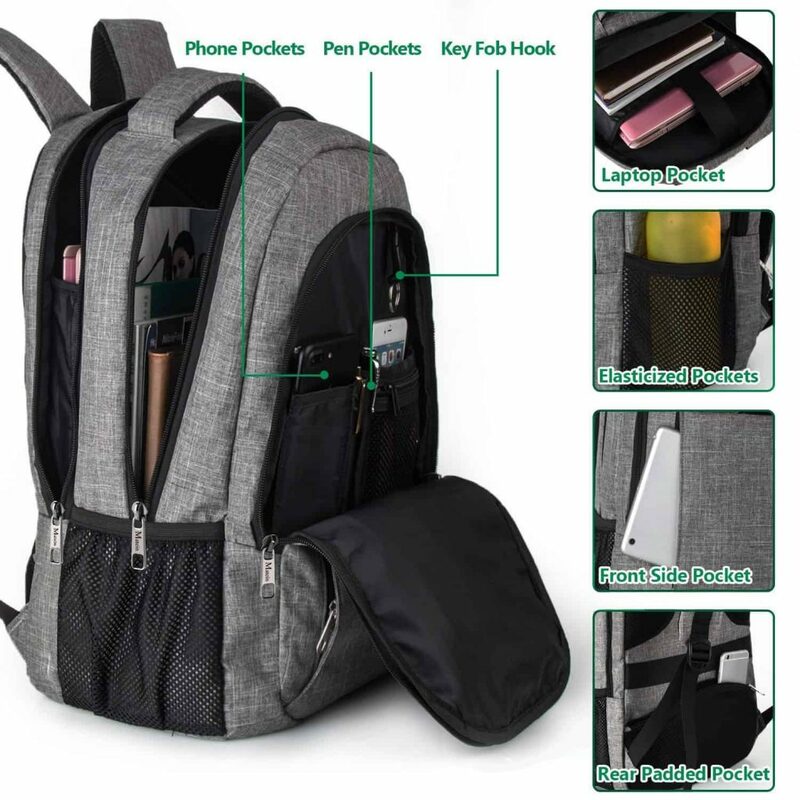 Backpacks designed to carry laptops will have a compartment for your device, along several others, usually, and will be advertised by the screen size of the largest laptop it can hold. There isn’t usually a vast amount of room for your other stuff if you buy the right size for your laptop. Sometimes it pays to go a size up. 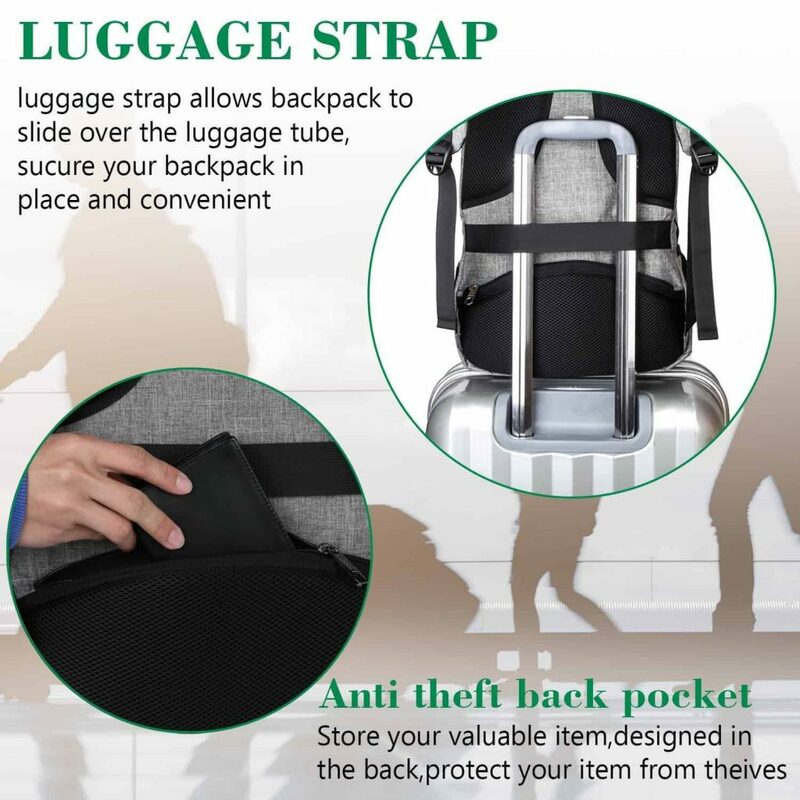 It’s a good idea, too, to look for one with zipped pockets on the outside for easy access without giving any would-be thieves a look at what you’re carrying by having to open the main section. 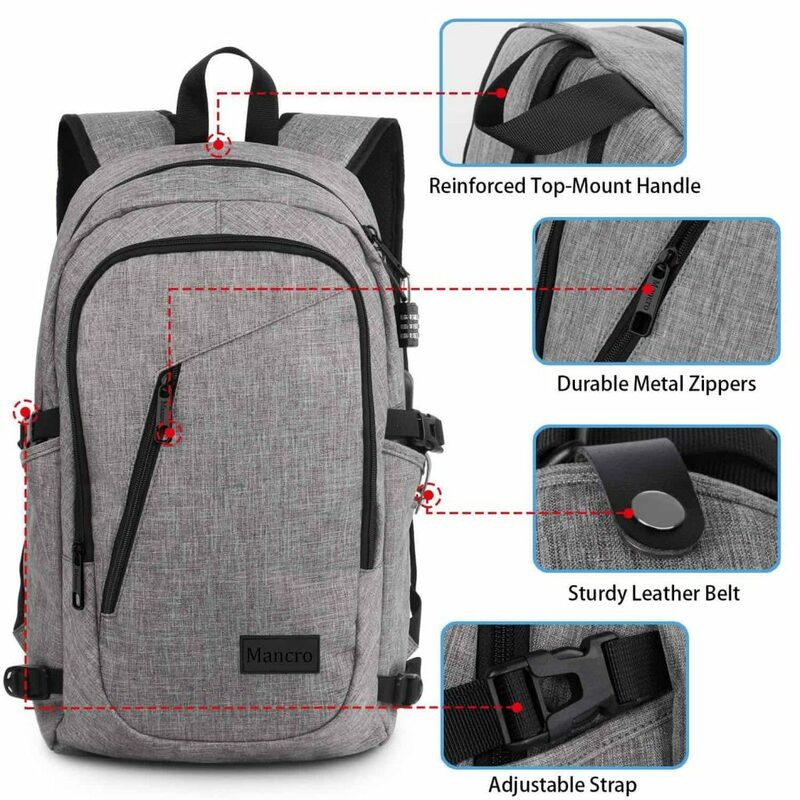 Laptop backpacks should incorporate some sort of padding to protect from any bumps, often having a double layer at the bottom, and it’s sensible to look for padded shoulder straps to aid your comfort. 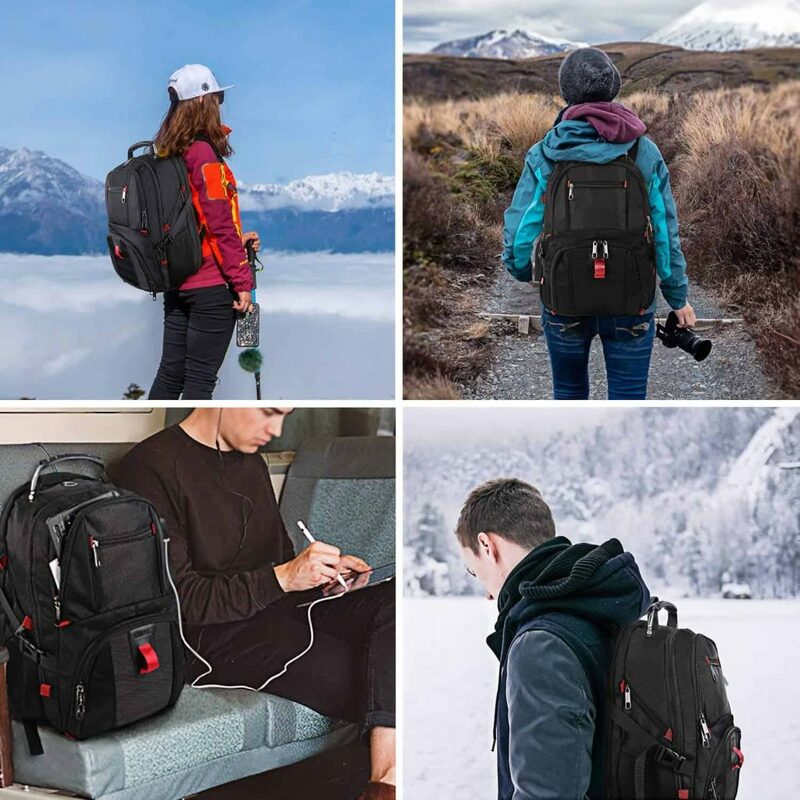 Manufacturers often use water resistant material for the outside, however bear in mind that water or shower resistant is just that, and only backpacks marked waterproof are guaranteed to keep your device dry. 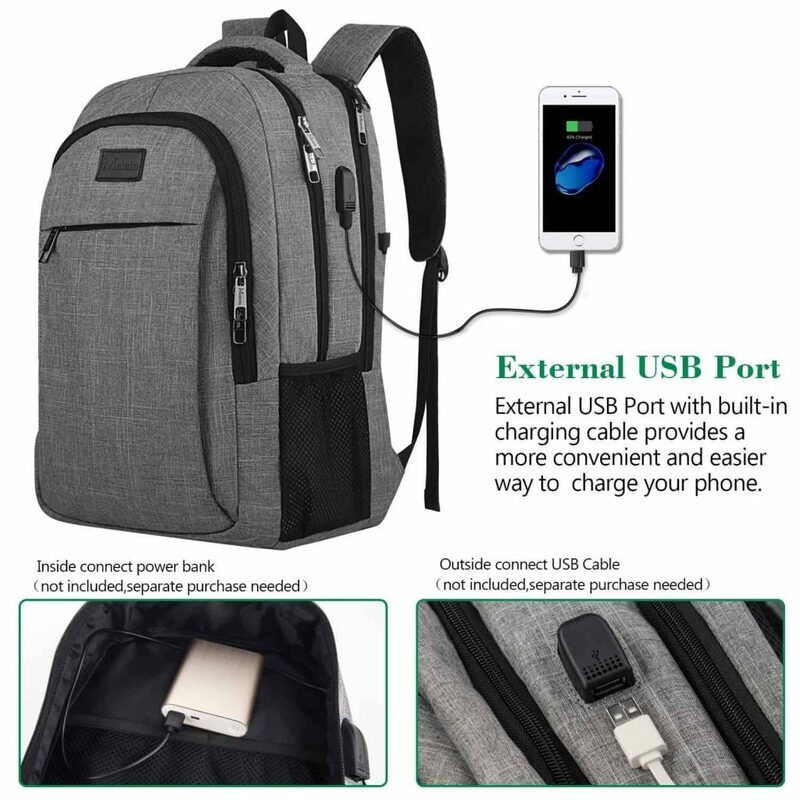 More and more laptop backpacks incorporate smart technology – not just holes for your ear phone cables, but USB charging ports, and Bluetooth tech, meaning you can easily work on the move. Much better than the humble old carrier bag! 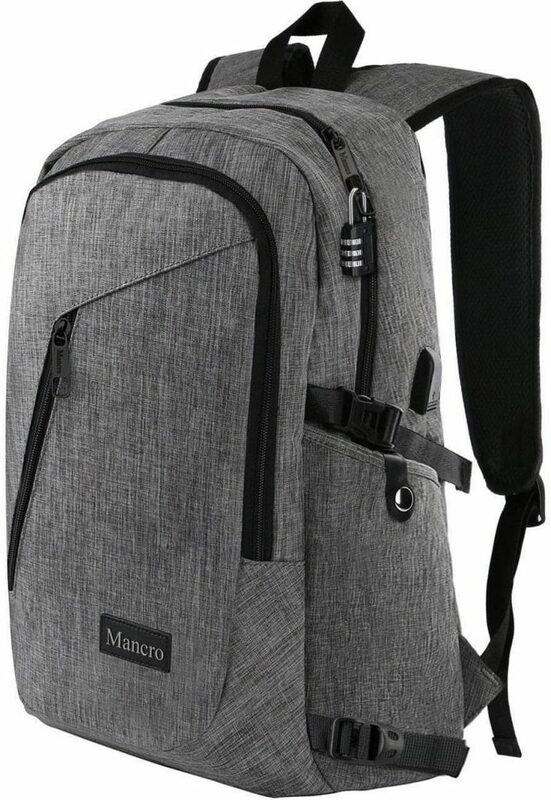 If you need a durable, tough backpack, this is perfect and has so much space inside even with a decent sized laptop in there. It feels very well made and nicely padded throughout. 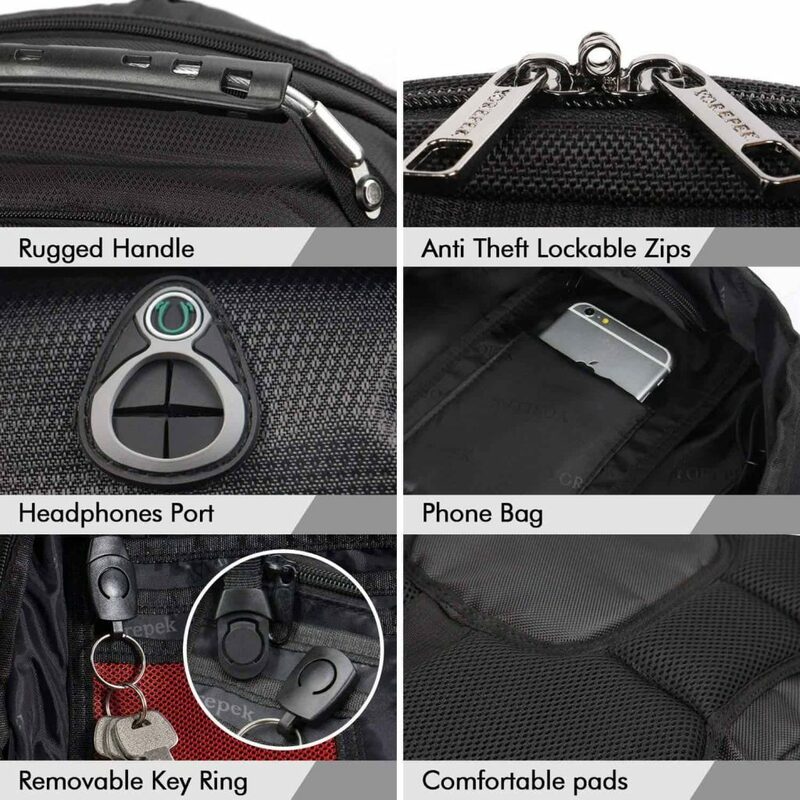 There are many little useful touches with this; the way the zippers meet when they are done up is perfect for attaching a lock, the anti-theft pocket is great for passport, wallet, cell etc, and of course the USB port for charging on the go. 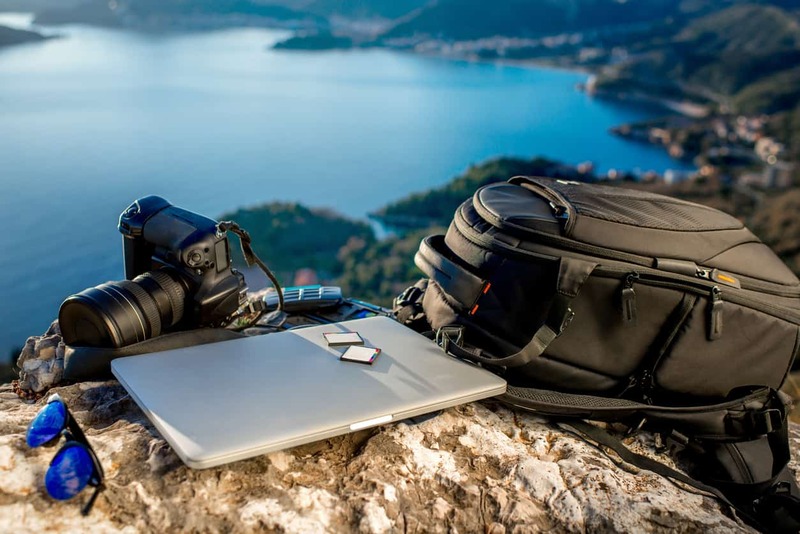 This amazing laptop backpack is made from breathable (waterproof!) materials that allow air flow, which it super comfortable to carry all day. 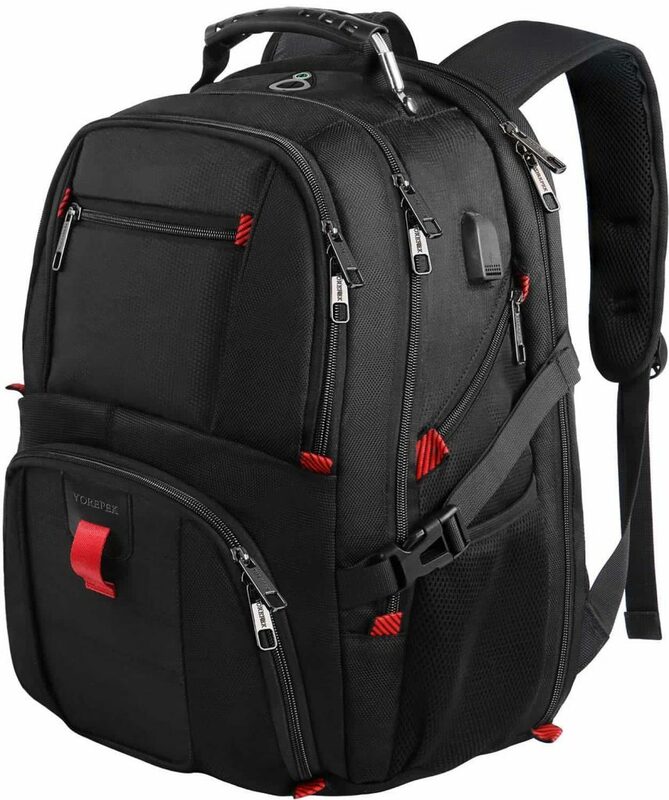 There are adjustable shoulder straps, a padded carrying handle and a lockable zipper head. Even when this is full and feels heavy when you pick it up, once settled on your back it seems remarkably light due to the solid shoulder straps and the weight distribution. We couldn’t find anything wrong with this laptop backpack. We only wish it came in more colors as this one’s a keeper. 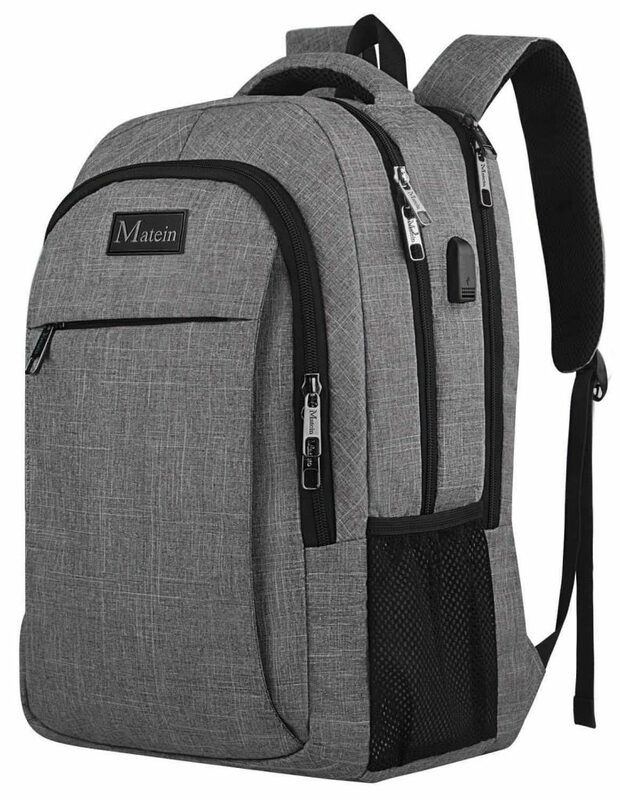 This is a really super backpack with so many pockets, very comfortable to carry, and with the USB port. Great for business, school and global travel. A really well made and tough backpack. The zippers are solid metal – once padlocked, nothing is going to get through them. The padding feels good, and all the straps seem securely attached. The amount of space in this is awesome – there’s a pocket for everything, and even with a laptop it, we had room for a ringbinder, a couple of books, a magazine and a thin top, with a couple of pockets still empty. Although this says water resistant, it almost seems waterproof. We all got rained on, some pretty heavy showers, and everything remained nice and dry – in the bag anyway! The use of eco friendly materials is appreciated. 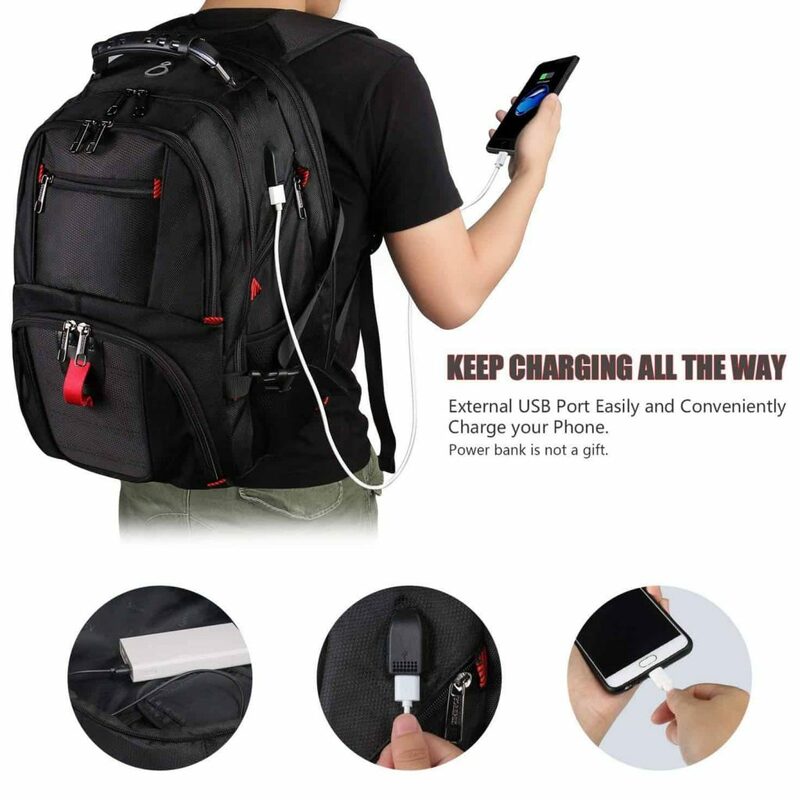 This laptop backpack is well made but it’s not designed to carry very heavy loads. A standard laptop and a couple of books is fine, anymore and you might eventually cause the materials to show signs of wear. Having said that, this is ideal for every day use. 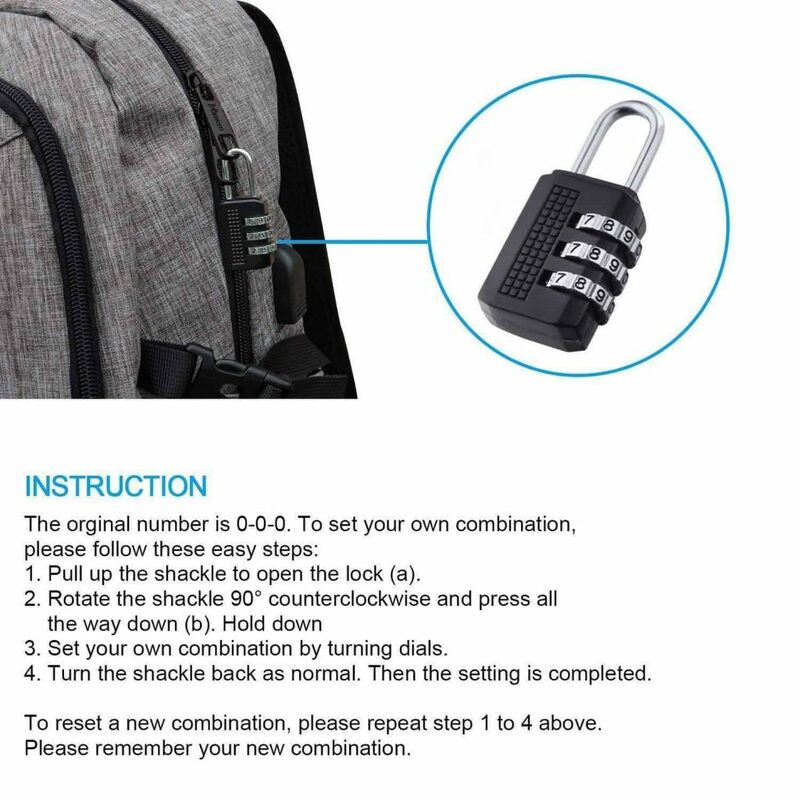 This is a comfortable to carry, hard wearing, security conscious backpack. Very happy to recommend. 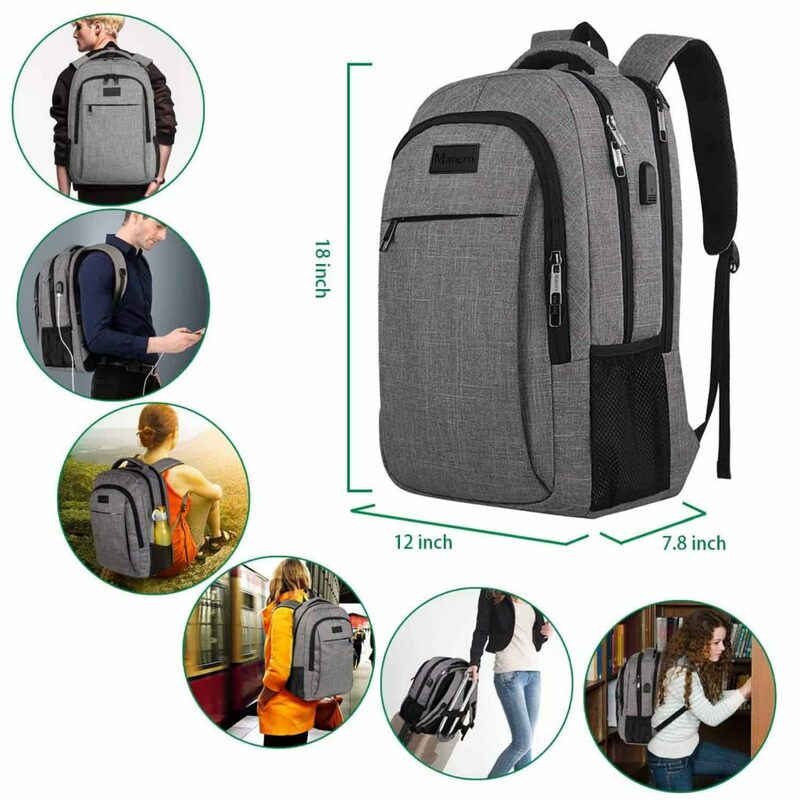 This backpack really is extra large – it has pockets on top of pockets. It’s tough, durable and looks it. It’s well made, padded all over and the stitching is all intact and perfect. We feel the stylish tone brings a fresh young looks to the laptop backpack genre; the others can be far too sensible, whereas this is so much cooler. 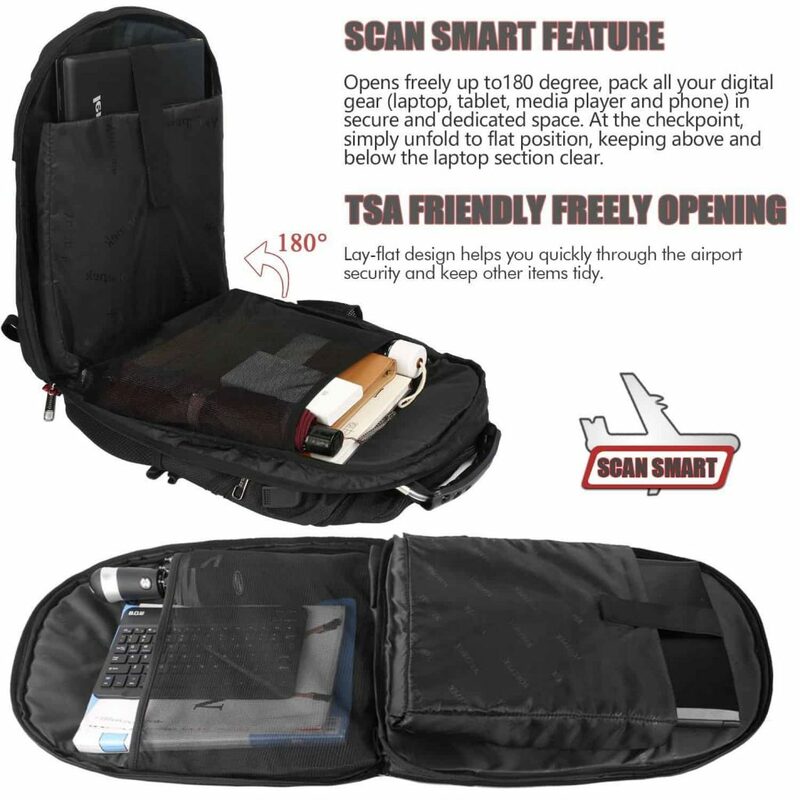 At the same time, this TSA approved laptop is ideal for business trips. 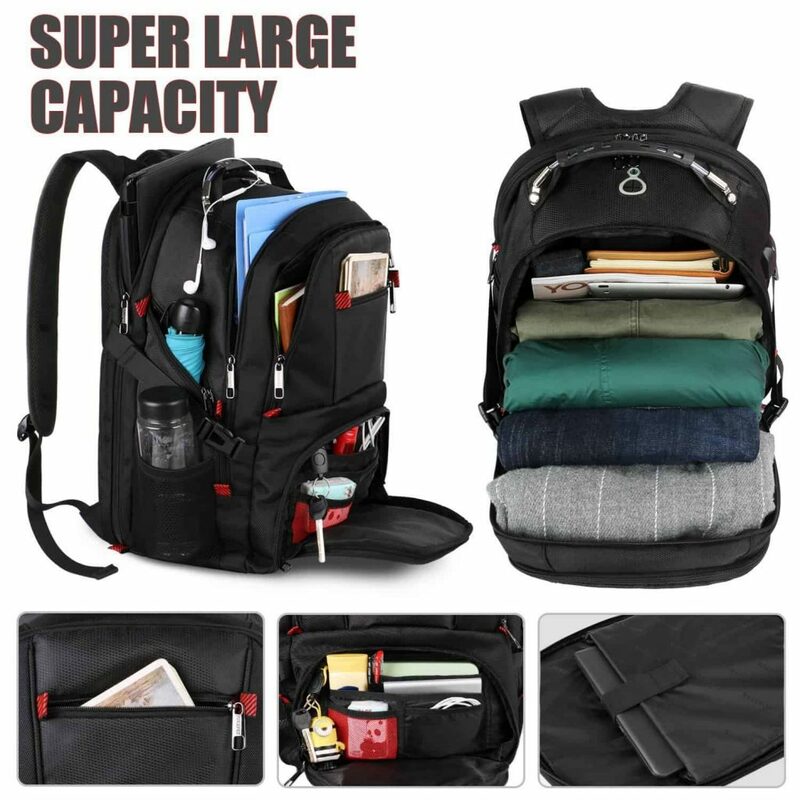 It has extra large capacity with an impressive 20 pockets fitted in 3 x compartments. Your laptop and tablets will be held securely in place. There is an external USB port for charging your devices, and a handy U-shaped ventilation design. 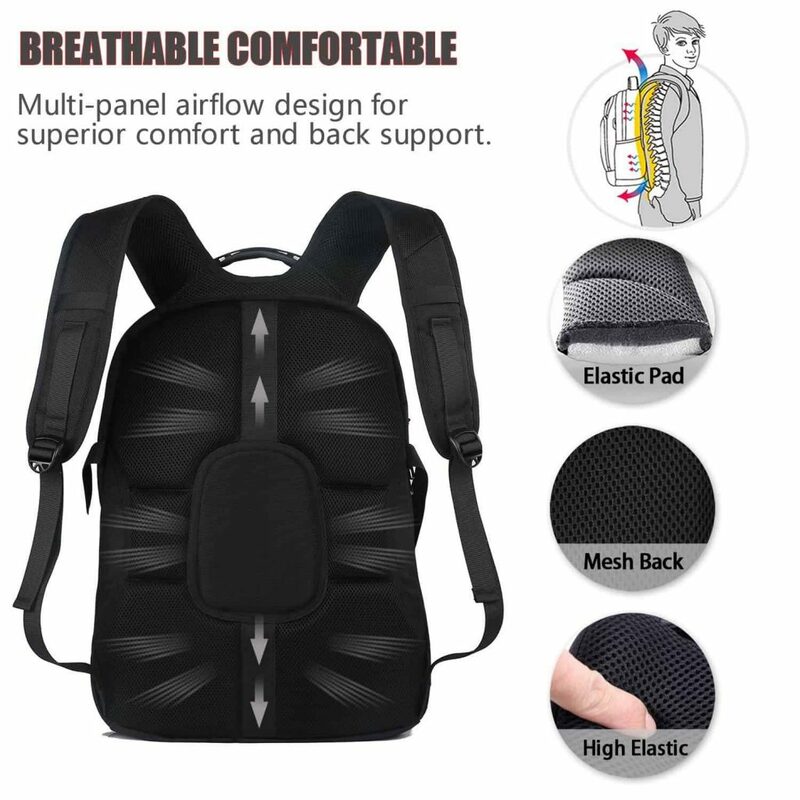 This laptop backpack is breathable, water resistant and nice to wear. 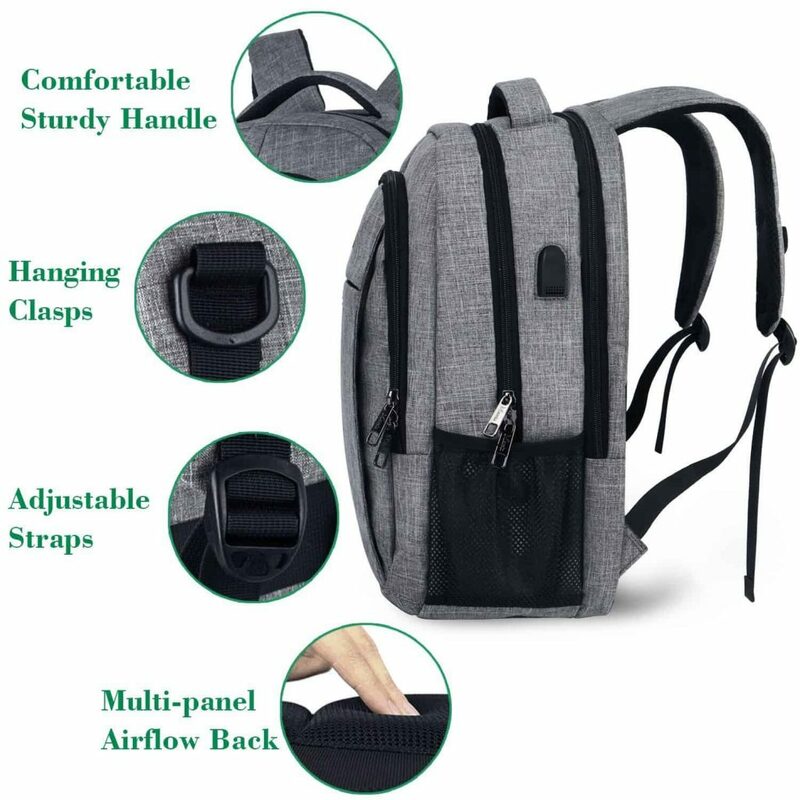 Even when full, the placement of the shoulder straps makes carrying it easy. The compression straps at the sides are an ingenious idea – you can tighten them and the bag sort of squishes up a bit. Everything inside is fine, it just seems to ‘shrink wrap’ the contents slightly. This is a really minor issue but the inner lining rustles and is slightly annoying. 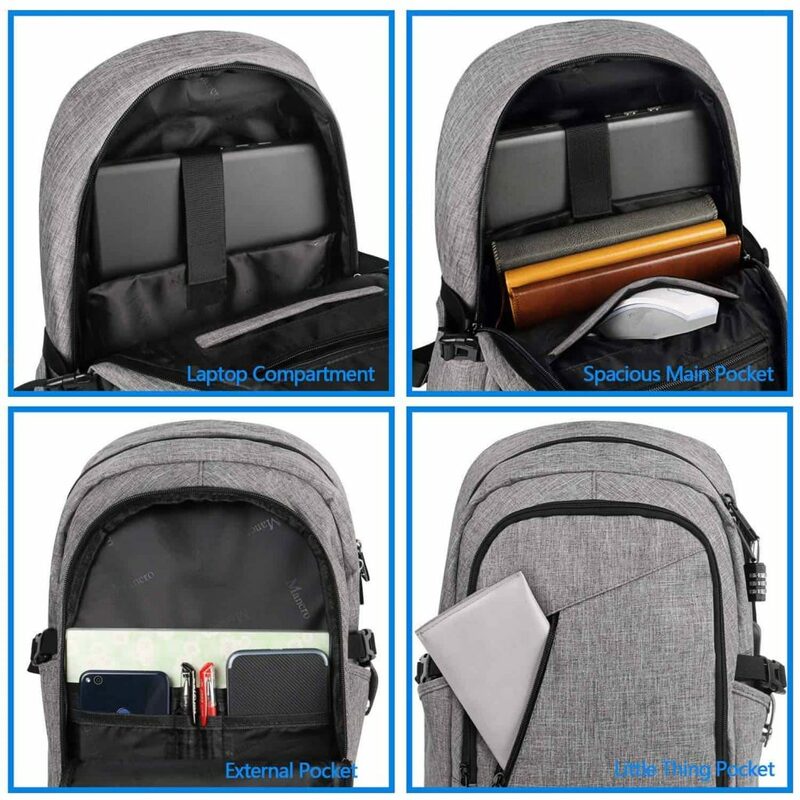 It’s quite loud when you root around in it to find that elusive pen, or the much needed candy bar, but we can live with it – we still love this laptop backpack. 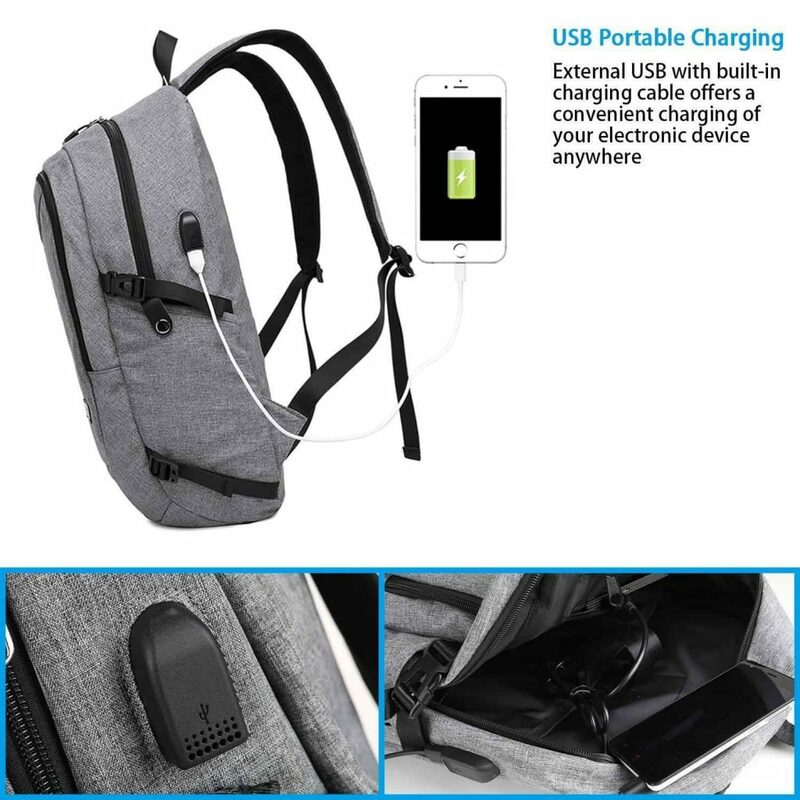 If you want a cool backpack to carry your device in, that’s durable, tough and a great size, this is the one for you. Want more? Check out other trending smart wearables!